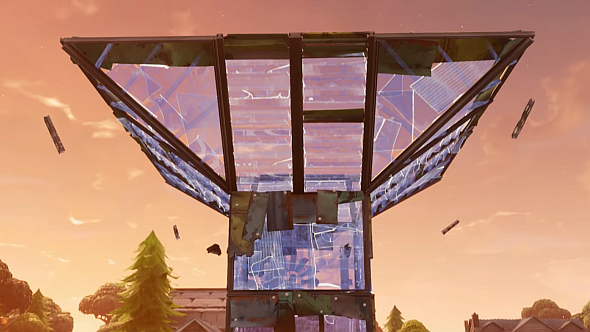 Update, April 12: Here’s what happens if you build a Port-a-Fort inside a building. Fortnite’s Port-a-Fort is live now, helping out those who struggle with their building by spawning a three-storey fortress in an instant. But what happens if you try to build a fort inside a building? Fortunately, one curious Redditor has been investigating, and it seems that you can happily spawn a fort inside a building. In a video posted earlier today, a player ventured into the storm to drop a Port-a-Fort within a building in Titlted Towers. The fort sprung up almost immediately, bursting through the building, but otherwise neither taking nor dealing any more damage. Update April 11:Fortnite’s new port-a-fort is now live. Fortnite’s latest item, a grenade that spawns a small, prefabricated fort where it lands, will be available in-game as soon as the servers go up after the v3.5 update. At time of writing, downtime for the update has just started. V3.5 includes port-a-fort – so it’s not coming with tomorrow’s weekly challenges, as many had assumed – as well as an updated 50v50 mode and replay system for battle royale. Port-a-fort has caused some consternation among Fortnite players, some of whom believe it trivialises the game’s unique building mechanics and thus lowers the skill ceiling. The patch notes make clear that Port-a-forts are of epic rarity, however, so they’re not about to replace regular building. Original story April 10:Yet another new Fortnite item is on the way, but this time around the focus is on defense, rather than attack. The Port-a-Fort is a new throwable item that will spawn a small fort where it lands. The item showed up in Fortnite’s New Updates section last night. The description calls it a “new portable fort sprouts a quick defensive position upon impact.” It’s not exactly clear how expansive that defensive position will be, but don’t expect an enormous ten-story fort to spring up at a moment’s notice; from the image on the side of the item, it looks like the fort will be three stories high, with a door at the bottom and stairs leading up to the top. That top story fans out from the main tower, giving you some extra lookout potential. In the mid-game, when fights can break out from any direction at any time, the Port-a-Fort will be invaluable, but it’ll be useful in the late game as a good foundation to build from as well. That said, don’t rely too heavily on it – you’ll still need your own materials, and it’s no replacement for learning to build your own forts quickly and efficiently. We don’t yet know when the Port-a-Fort will arrive in-game, but given Epic’s speed when it comes to shipping new content to Battle Royale, we could see it as early as this Thursday, when the new weekly challenges arrive. The most recent new item is Fortnite’s Guided Missile. Sadly though, for all these new items, there’s still no sign of the elusive jetpack.